And we mean it. Not only does this build include a month of Dmitry’s work, but we also merged in Mohit Goyal’s Summer of Code work. That touched a lot of stuff… There is at least one known crash — the sketch brushes are broken. We’re working on fixing, but we need more testing! Please join the forum and report your findings! Okay, so what’s in here? Dirty Presets: Keeps temporary tweaks made to the preset till the session ends. Go to the Brush Editor box. Bottom left — select “Temporarily save tweaks to presets”. Any time you make a change to any setting in the preset — the textbox will turn pink and a “+” symbol will appear on the icon. The Reload button is used to reset the tweaks for that particular preset. In the brush editor box, for any paint option like “Size” on the left, there will be a “link” icon. Right click on that option to Lock the option. Now that particular setting will remain constant across all presets. 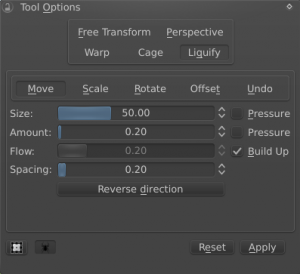 If you change it in one preset – the changes will reflect across all presets. To unlock any option: right click on a locked option and click on Drop Locked Settings. You can either use these settings in the preset or load the last settings available in the preset. 1. To use this feature, you will have to first have to go to Settings->Dockers->Undo History to activate the docker. Time to group the strokes : According to this parameter — groups are made. Every stroke is put into the same group till two consecutive strokes have a time gap of more than T seconds. Then a new group is started. Individual strokes to leave at the end : A user may want to keep the ability of Undoing/Redoing his last N strokes. Once N is crossed — the earlier strokes are merged into the group’s first stroke. Next, Scott Petrovic has been putting a lot of polish on Krita! Keep Eraser size. Now, toggling Erase mode with the ‘E’ shortcut will save the size of your current preset. That means that if you paint with a small brush, then erase with a big brush, you only have to press ‘E’. And a lot of polish in other places as well — better defaults, labels for previously unclear sliders, ‘C’ is crop tool now, and more. If you’ve got a good proposal for a better layout, please share your ideas on the forum! Right now, Dmitry is working on the next part of the Kickstarter feature list: non-destructive transformation masks. Boudewijn Rempt did some more OSX porting work — the file dialogs should now be native and work correctly — and started working on loading and saving resource blocks, layer styles and transparency masks in PSD. And we’ve got a nice icon clean-up, too, courtesy of Wolthera and Timothée. Sven Langkamp has worked mostly on the MVC branch, which is where we’re trying make Krita open more than one image in a window. He got it stable enough that we could start testing for real, and Wolthera dove in and made reports… There’s a lot of work to be done here! For Windows, I’ve added a zip file next to the MSI installer. Unzip the zip file anywhere, go into krita/bin, double-click krita.exe and you can test this build without breaking your real installation. Remember — this build is not ready for daily work, it’s experimental. For OSX, here’s a new DMG. Other than the file dialog fix, there’s no new OSX specific fixes in here. We’re still mulling over ways to fund a proper OSX port, among other things. For Linux, Krita Studio users have access to a package for CentOS 6.5, and Krita Lime has been updated for Ubuntu users.